November 18-20, 2011 - Steven's Papa visited us. Went kayaking, dined at Clyde Common, Mission Theater and Pub, Pine State Biscuits, took in the Bodyworks & Brain exhibit at OMSI, SoHo happy hour! September 16-18, 2011 - My friend Amy Walsh, from the ATL, was here, kayak'd, explored the gorge and downtown area. August 5-7, 2011 - Got ourselves a little dog. His name is Toddrick. June 17-19, 2011 - House & dog sitting... Naked bike ride, Sunday night grilling that went way into the night. June 10-12, 2011 - Fleet ships, Grand Florale parade and a lot of carousing around the city. 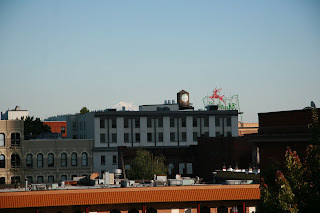 June 3-5, 2011 - hiked up to the Rose Garden on the first golden sunshiney weekend. May 27-29, 2011 - staying in town. May 20-22, 2011 - Seattle bound. May 6-8, 2011 - busy weekend in town. May 3, 2011 - first soccer game at Jeld-Wen field. US Open Cup. Timbers lost to Earthquakes. April 29-30, 2011 - Wooden Tulip Shoe Farm, indoor soccer - second sunny weekend! April 22-25, 2011 - Float on! experience, disk golf - our first sunny Saturday! February 18-20, 2011 - healing from blisters on my heels. February 12-13, 2011 - Snowshoeing near Government Camp, OR. Decided on Trillium Lake trail. Zipcar members as of January 24, 2011!!!!!!!! December 3-5, 2010 Seattle, Washington - my birthday weekend BOOKED!